noun - a perceptual pattern or structure possessing qualities as a whole that cannot be described merely as a sum of its parts. 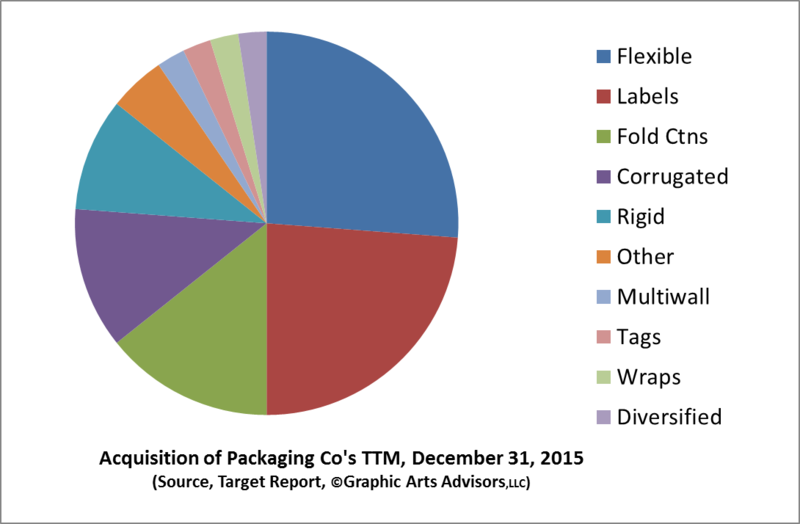 The Target Report has been chronicling merger, acquisition, and restructuring activity in the printing, packaging and related industries since 2011. Each month we publish the results of our research and analysis of the macro-trends, often focusing on a particular segment. In January, we look back at the entire year and humbly offer our general projections about the coming year. In the absence of having our own crystal ball, we attempt to bring some science to the art of making projections. In essence, we overlay and correlate industry merger and acquisition transactions with restructuring activity (bankruptcies and closures) to form a predictive model applied to specific industry segments that make up the whole. (Wow – this sure is a dry start to what we hope will be an interesting peek into our extensive information and data). So there you have it - a theoretical foundation for the following projections. As you read through the following information, please keep in mind that many companies in the printing, packaging and related industries have more than one specialty. For our purposes here, we designate what we deem to be the primary service offering of the companies involved, and most often assign a secondary specialty that differentiates the company. During 2015, we found 212 M&A transactions that were of interest. 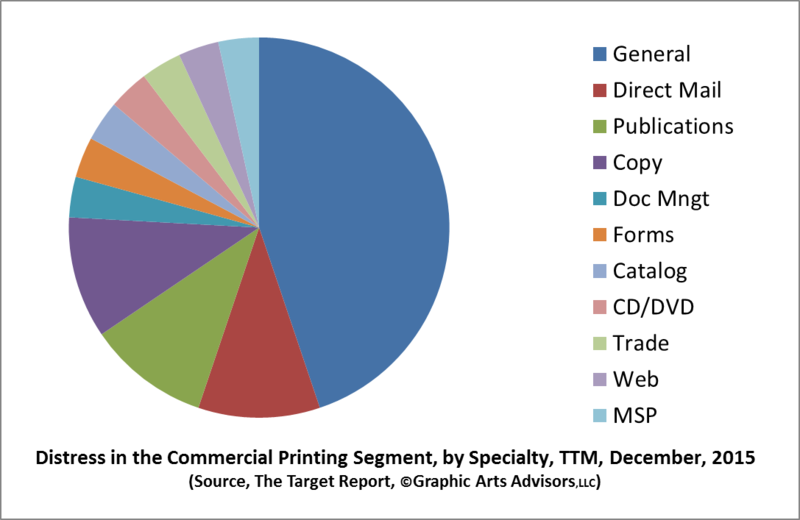 Of these, we designated 45 as being primarily in the Commercial Printing segment. As noted previously in The Target Report, M&A activity in the commercial printing segment was fairly brisk during the beginning of 2015, but the momentum went out of the market in the late summer and has picked up a bit since. Transactions are occurring, but not at the rate we might expect given the improving economy and demographic trend of entrepreneurial baby-boomers reaching the age at which owners often sell their businesses. 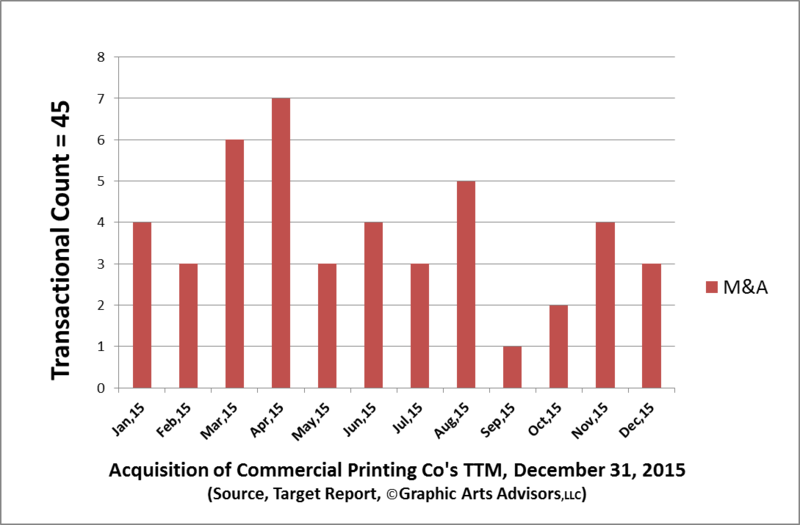 In the following graphic, we can see that almost half of the transactions occurring in the commercial printing segment were acquisitions of general (i.e. 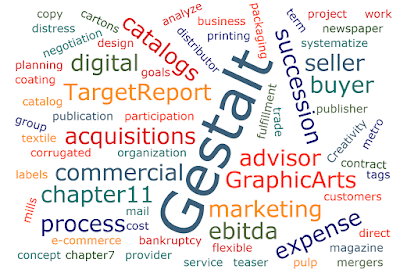 largely undifferentiated from other “job shops” offering a similar menu of graphic reproduction services). 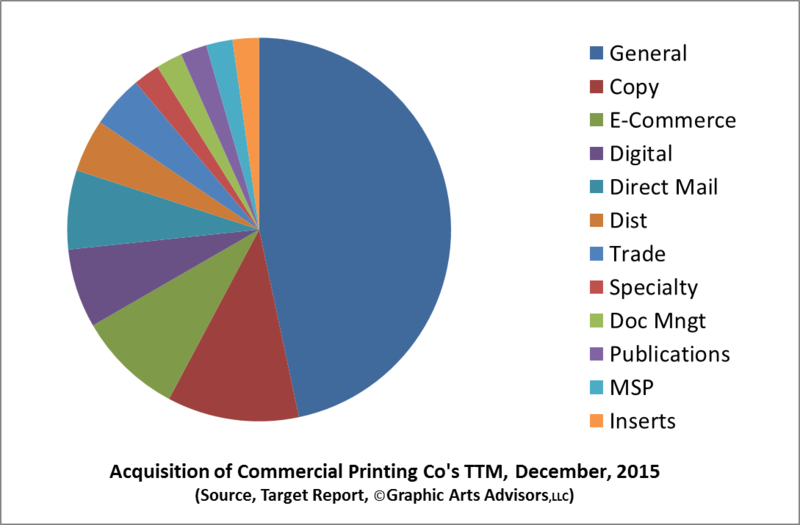 There is significant interest from active strategic and financial buyers to acquire printing companies that specialize in the packaging segment. There is good reason for this as growth and stability in packaging printing is perceived (correctly we believe) as much more sustainable and less subject to disruption from electronic media. We also know that valuations are significantly higher in the packaging segment. 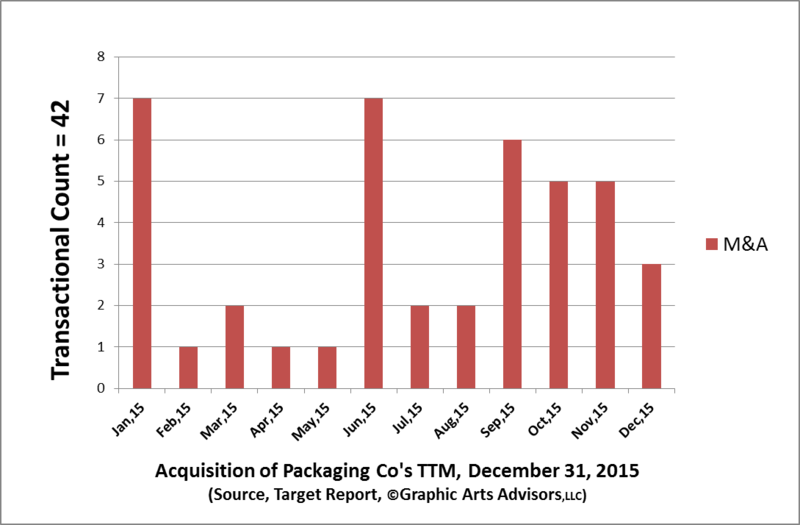 Nonetheless, the data from 2015 suggests that many sellers are waiting, although the tepid pace of packaging-related M&A activity in the winter and spring has recently picked up. When we parse the data on packaging transactions, a clear picture emerges – flexible packaging companies are in demand, followed by their close cousin in the use of flexo technology, label printers. There were several notable transactions in the corrugated segment, especially in the latter part of the year. No surprise here as the growth in online commerce and direct delivery drives demand for corrugated cartons. Publishers of newspapers and magazines are significant buyers of printing services. As the publishing industry evolves, this has a direct effect on the demand for printing, paper and other print-related products. 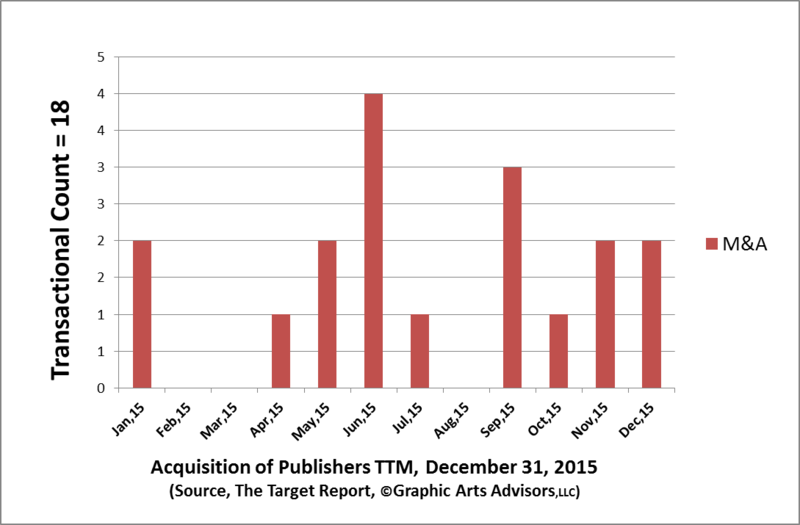 The major players continue to divest their print assets, focusing instead on broadcast or online digital channels. The spun-off print-centric publishing units, as well as smaller independent publishing entities, have produced fertile grounds for acquisition activity. 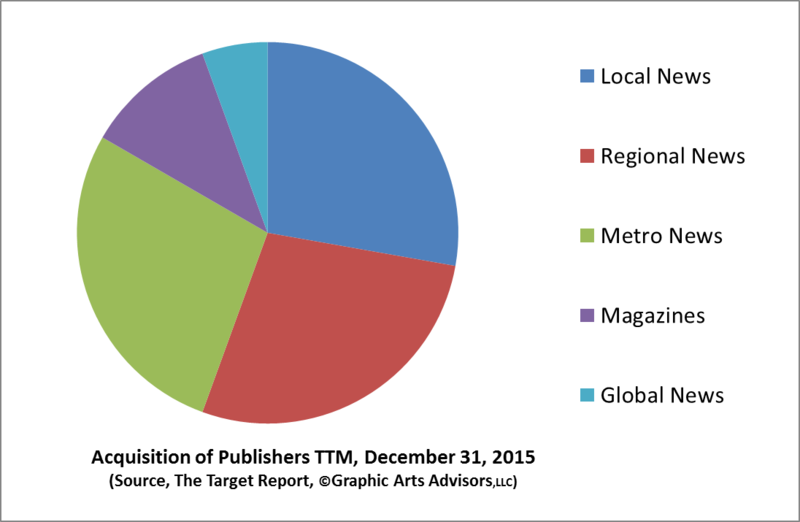 By a wide margin, the transactional activity in the print-publishing segment during 2015 was related to newspapers: local, regional, metro and one global newspaper. 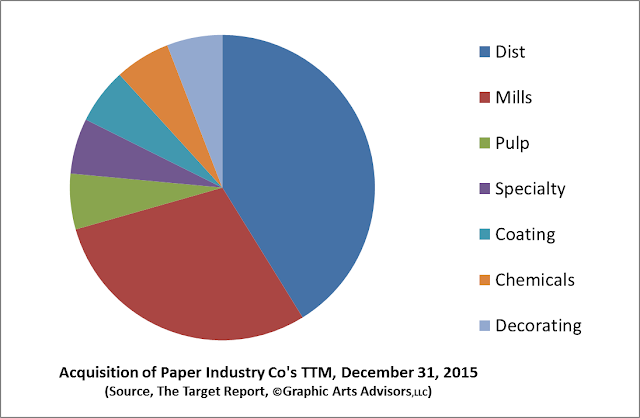 As we can see from this graphic, below, there were several sales of paper distributors in 2015, and the business of manufacturing paper and pulp remains an active segment for transactions. Now for the “overlay” we promised in our introduction to all these charts. As regular readers of The Target Report know, in addition to our work on the positive transactional side of our industry, we also research (and work with) companies that are in some level of distress. We found 63 instances during 2015 of companies and/or plants that announced that a facility or company was closing or filing for bankruptcy. Closures often meant the loss of manufacturing capacity and jobs, but not always for all the employees as on occasion the closing of one factory was accompanied by the movement of equipment and employees to another location owned by the same company. (Note: “tuck-in” transactions are not included these figures, rather those transactions are considered in the figures for M&A.) 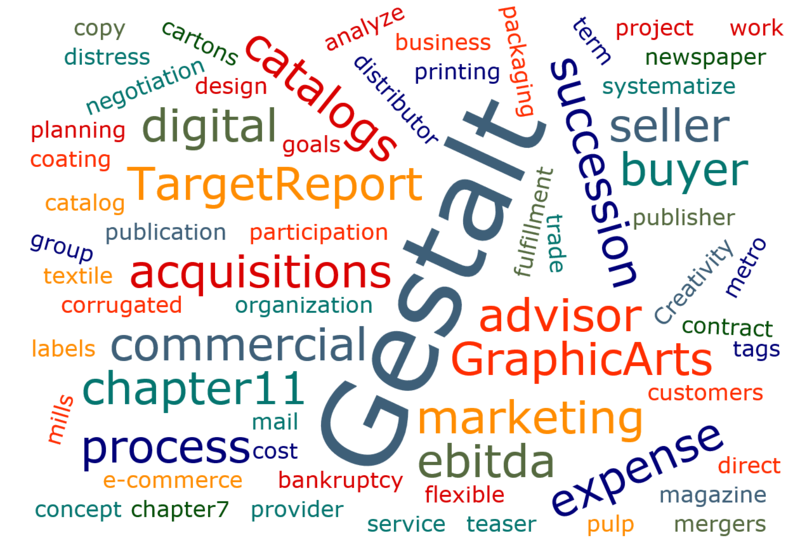 Chapter 7 filings are always liquidations that result in the complete shutdown of operations and loss or employment, while Chapter 11 filings are reorganizations, often resulting in a 363 sale of assets (including the ongoing book of business) under the supervision of the Bankruptcy Court, and occasionally the emergence of the company from bankruptcy with a newly cleansed balance sheet. These events indicate a level of distress in the business and when occurring in greater numbers within a specific segment, tell us where the greatest pressure is within larger context of the printing and packaging industries. It’s clear from the above graphic, that commercial printing is the most distressed segment, with a strong negative indication also in the publishing, newspaper printing and paper industries. Finally (we could go on…), we have one more chart, in which we drill down into the commercial print segment to see where the distress is most prevalent among commercial printers. 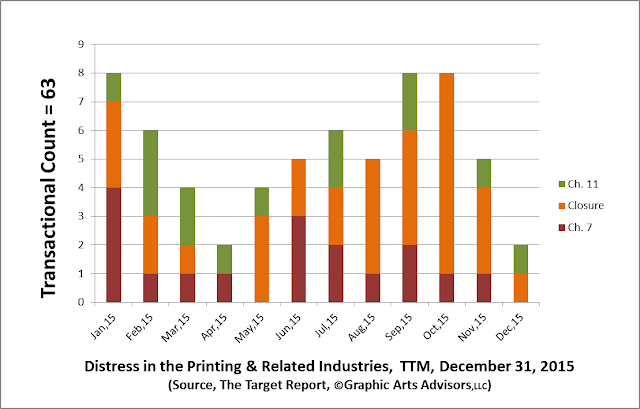 As we can see from the next chart, the largest portion of distressed commercial printers are ones we deemed to be “general” and lacking any specific market or product focus. A strong negative showing is also indicated by direct mail printers, publication printing and copy shops. In our opinion, the combination, or “overlay”, of the number of transactions with the level of distress in a particular segment of the overall industry provides a meaningful predictive guide for the short term prognosis for the various segments. In other words, a high level of transactional activity combined with a high level of distress events indicates a negative downward trend for the segment. Conversely, a high level of transactional activity with a low level of distress events indicates a positive upward trend for the segment.